Place 1 oven rack in bottom rack position. Heat oven to 475°F. Spread tomatoes, bell peppers and onions in ungreased 15x10x1-inch baking pan. Drizzle with oil; toss to coat. Sprinkle with taco seasoning; toss to evenly coat. Bake at 475°F. on bottom oven rack for 15 minutes or until bell peppers and onions are crisp-tender. Meanwhile, spread 2 tablespoons refried beans on half of inside of each taco shell. Arrange taco shells on ungreased cookie sheet. Place on middle oven rack in oven with vegetables. 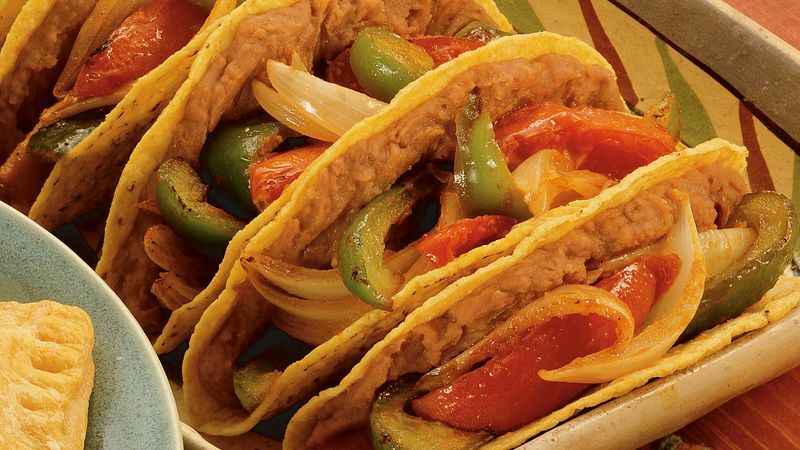 Bake both for an additional 1 to 2 minutes or until tacos are warmed and vegetables are tender. To serve, spoon about 1/3 cup vegetable mixture over refried beans in each shell. Serve with salsa.